I heard about a cool project by Adam Baker (ManVsDebt.com) which I would like to share with you. Adam and a crew of four other film makers travelled the U.S. for about two months to create a documentary about complacency. I watched the trailer and now I am really curious to see the whole movie. Unfortunately, the production of the movie is more expensive than the team expected. If you are receiving about 30 to 50 or more emails per day, my email filter strategy might help you to optimize your inbox processing by prioritizing incoming email based on filters. Christmas is coming up and hopefully you all will have some time to sit down, relax, review the past year and make some plans for 2012. I know that “living without goals” seems to be state of the art nowadays, but if you are living an a goal-oriented business environment – like I am – where you cannot wake up and just do what you are passionate about, a system to manage yourself will be essential for your success. This is why I recommend to structure your ideas and to make some plans for 2012, now. A few days ago, the headline “My secrets to productivity” within wordpress “Freshly pressed” caught my attention and I took the time to read Jolie O’Dell’s post about her productivity secrets. I was really surprised about the similarities to my habits. Even if I try to get up at 5:00 am, compared to her late 6:30 am ;-), I try to make use of the early hours without interruptions by colleagues, incoming calls, or emails. Her advice is to “Wake up half an hour before anyone else” and I can definitely confirm this message. But most interestingly, she mentioned that this head start makes it possible to process emails without receiving answers right away. While reading her post, I realized that I am already using this “feature” without thinking about it for years. Processing emails before others get up really reduces interruptions by incoming answers to your emails. In addition, after cleaning the inbox in the early morning and after checking the tasks of the day, I have the time AND – most important – the calmness to work on my most important tasks even before other colleagues start working. Jolie also talked about the downside of getting up early: Early to bed. For sure, this is not easy, but you can get used to it and if you want to get up at 5 o’clock in the morning, you simply have to sleep earlier. Usually, I try to go to bed around 10 pm to get at least six hours of sleep. 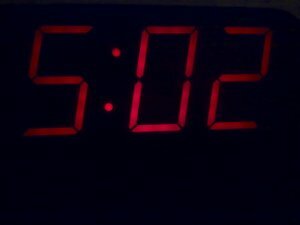 Yes, to be honest, it is really hard to wake up at 5 am. :-/ To make this easier, I started experimenting with sleep cycle software on my cell phone, but this could be another topic to write about. Thank you Jolie for sharing your secrets to productivity. Your post made me aware of the power of using the early hours. …and now, it is time to go to bed. As my days were very busy during the last weeks, I used the time on a flight back home today to review and to think about what really helped me to stay on top of what I am doing. Besides the support of my wife the two tools I am using frequently are my target mind map and my task management system. About my mind map I have written another post already. 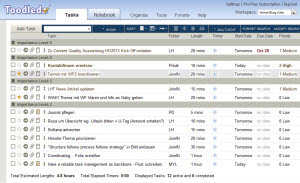 Now I would like to take the opportunity to share my task management experience in busy times with you. I am always looking for ways to simplify my self management system. In the past, I used an excel sheet to manage my goals, but a few month ago, I started using a mind map to organize and review my targets.